Directed by Alejandro Gonzalez Inarritu, staring Michael Keaton, Zach Galifianakis, Edward Norton,Emma Stone and Naomi Watts. An actor who used to play the part of a superhero for a series of films decides to try and resurrect his career and reestablish his family with a play he places all his hopes in. This film created all kinds of award buzz and won it’s fair share as well. Though interestingly enough not one of the trailers that I saw gave any kind of hint or true description of what this film was actually about, the trailer’s were short and sweet. The only trailer that I saw with any actual content was at a train station where this scene depicting that moment in the film where Keaton controls explosions and takes flight. 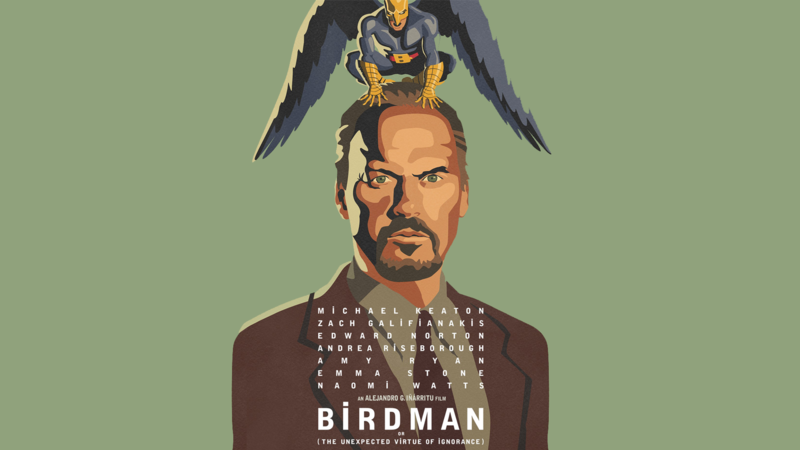 This alone I found very clever after having watched the film and understood it’s clever script, Birdman deplores that as an audience we no longer seek to watch deep philosophical debates and instead wish to witness explosions and action sequences. Indeed the first part of this film really takes note on how many superhero films are currently been made and name after name disappearing into the blackhole of comic adaptations unable to perform a play, so the film argues. With Michael Keaton as the main star, one which I do not think anyone else would have been able to play as the film seems designed for Keaton, the film has a very strong start. The editing is something to particularly marvel at, with editing it appears that nearly all the film is just one continuous shot. This gives the first act a pace reminiscent of ‘The West Wing’ with fast dialogue and quick pacing of the characters. While this first act is very strong as it’s a unique take on a film that makes it very engaging, the focus is somewhat lost in the second act. A slower pace is now established which begins to drag on the narrative of the plot which in turn then creates this slower pace for the rest of the film, which with only minor moments in scenes resorting back and giving hope. A shame considering some moments in particular later on are really engaging but lose the gravitas it should have had. Here is where I disagree with the Academy Awards, when examining some of the films nominated for best picture such as ‘Whiplash’, ‘Boyhood’ and ‘The Grand Budapest Hotel’ all these films were not only engaging throughout but left me with a hunger for more, captivating throughout and brought a real energy to the film. Birdman while a really interesting choice for the reasons previously mentioned, truly lacking in both this aspects. A shame given the great performances, the thought provoking script and the music to accompany. I watched this film some time ago and decided to re-watch it for the sake of reviewing and still I reached the same problem in the focus of the energy. OVERALL *** A clever thought provoking film with a unique cast and direction but ultimately let down by the uneven tempo, the slow pace and its own lacklustre energy after the first act is disappointing with a few pivotal moments of grace. RECOMMENDATION- I would still highly recommend as it is a superb film and maybe it is just me who feels this way but I do not think it should have received best picture.